Click the logo to make a donation to our team! Dr. Stan Gorgol was the new chairman this year. He brought back Relay in honor of his dad. 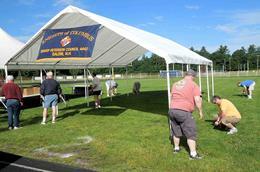 Relaty was held at the Salem High field on June 23, 2018. At the council meetihng, he reported that the effort accumulated donations totaling $1,715 and $1,500 in raffle ticket money for a total of $3,215 for a cure for cancer. This was well above the goal set for the team. Stan Gorgol procured a TV as the raffle prize, thanks to the good graces of Rick Dube, of Dube's TV. The attendance and interest was down from earlier years; there were less sponsor tents. 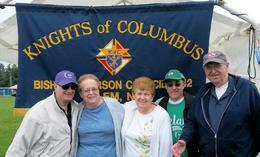 Special thanks to Dave Thompson and Al Faucher, who spent most of Saturday at Relay. Dr. Stan says this is still important and worthwhile to do. He will again chair the effort next year, and will ask for the continued support from his brother Knights. The TV raffle was won by Bob McGuire, retired Salem officer. The popularity of "Relay" in Salem has gone down because of competition from neighboring towns. 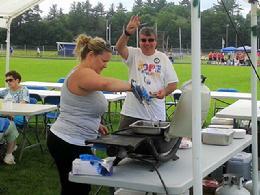 The council supports "Relay" with money and also by providing chairs and tables for the "Survivors Tent." This year of 2017, we did not have an official team nor a team tent. The 2016 Relay turned in scant funds compared to the hours of service put in, thus causing the council to down-size our effort. Sometimes, there are just too many competing events calling for help to accomdate everyone. Under the dedicated leadership of Brother MIchael Banks and in partnership with the Kiwanis Club of Salem, NH, Council 4442 is pleased to support and participate in the American Cancer Society's annual Relay for Life. This year's Relay for Life was held on June 20, 2015 11 AM- 11:00PM at Salem High School's Grant Field. The American Cancer Society Relay For Life is a life-changing event that gives everyone in communities across the globe a chance to celebrate the lives of people who have battled cancer, to remember loved ones lost, and to fight back against the disease. At Relay Salem, teams of people camp out on Grant Field at Salem High School and take turns walking or running around a track or path. Each team is asked to have a representative on the track at all times during the event. Because cancer never sleeps, Relays are overnight events up to 24 hours in length. Relay starts with a Survivors Lap an inspirational time when survivors are invited to circle the track together and help everyone celebrate the victories we’ve achieved over cancer. The Survivors Lap is an emotional example of how Relay participants are creating a world with more birthdays like those of each individual on the track. After dark, we honor people who have been touched by cancer and remember loved ones lost to the disease during the Luminaria Ceremony. Candles are lit inside bags filled with sand, each one bearing the name of a person touched by cancer, and participants often walk a lap in silence. Last, there is a Fight Back Ceremony, where we make a personal commitment to save lives by taking up the fight against cancer. A past event; the "Relay" continues to this day! The 2011 Relay was a great success thanks to many Knights and Kiwanis members, who by their tireless efforts to either raise money or contribute their time for the breakfasts, moving tables and chairs to the event and setting up the tents, led to our success. $170.00 contributed as a good will offering for those who wanted to have their picture taken with the trophies. Stan Gorgol, despite his illness, managed to raise $450.00, Wil Bamford raised $750.00 as well; thank you to both of these great men. Several Knights donated funds to purchase the TV as well as for the rental of a truck to move tables and chairs to the event. The TV was won by Frank Worthy, a Salem resident.